On December 14, 2016 a new chatbot called World Surf League has appeared in the AI Universe. It is the first chatbot for surfers on a Facebook Messenger platform. Usable list of athletes right in the Messenger. It’s very convenient to get the list of men and women surfers, so the list will be shown according to their rating classification. The list is shown in a form of gallery with photos of sportsmen. Leave feedback. 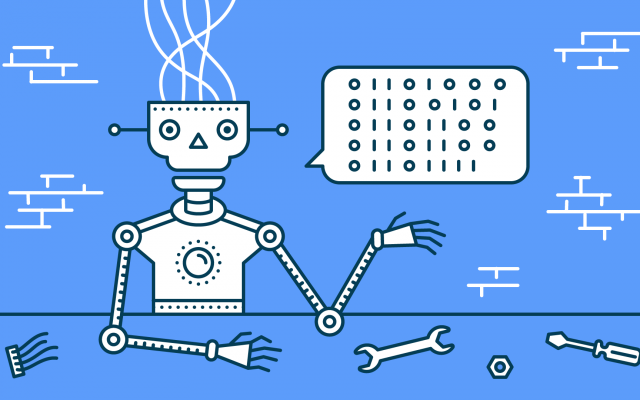 Bot creators are open to any suggestions and you can leave a feedback or recommendation on making a chatbot better right in the Messenger, or just write good words to the bot creators. Easy and convenient to use. You can easily skip from one section of the menu to another or use “Help” section that will show the tutorial of working with the chatbot. Two languages in the chatbot. Despite the fact that the bot is made in English, half of the flow is written in Portuguese. And if you ask “Você é um bot?”, the chatbot answers “Sim, sou o bot da WSL!”. Top list of women and men surfers. You can see rankings of the world’s best sportsmen and view top 3 men and top 3 women surfers. The top list is updating after each surfing event and competition, so a user will be always up-to-date. Good looking design. The chatbot has a bright and attractive menu, galleries with images of high quality, and it is easy to read titles and subtitles. Buttons have cute emojis that make the bot not just easy but enjoyable to use also. Subscribe to latest news and to the search result. Be aware of everything what’s going on in surf world by subscribing to Latest News. The subscription allows you receive the digest of articles in a form of gallery with pictures and a short description. In case you’d like to get updates or information about a certain athlete, you are welcome to subscribe to news exactly about him. Event notification, schedules (completed, ongoing and upcoming). Now you should not be worry about missing any surf event. This handy chatbot will let you know every time any surf event is going to happen by sending you a notification. 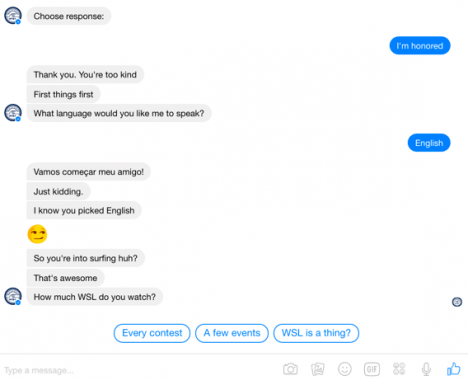 Whether the event is over or not, World Surf League chatbot helps you to stay up to date and provide you a needed information. Easy search of athletes on the website through the Messenger. Just type your query, and in a couple of seconds, you’ll have the exact content/information you are looking for from the WSL website directly in the Messenger. 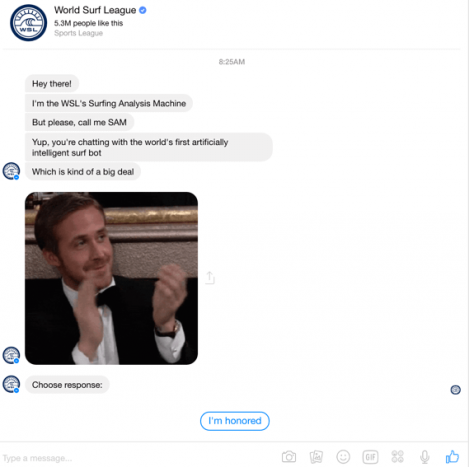 World Surf League chatbot is a good example of the successful combination of usefulness, simplicity, and style. Event notifications and latest news subscriptions give the reason to use this chatbot again and again. 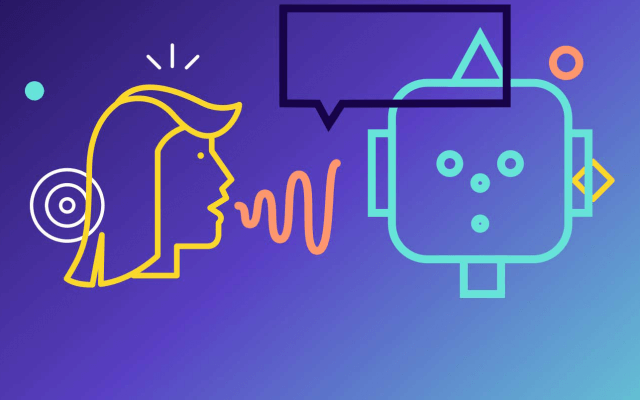 So, if surfing is an integral part of your life you should definitely try this well-designed chatbot and make sure of its functionality and usability.